It has been a tradition ever since we got married, we will celebrate the 1st Ramadhan at my better half's kampung. This year is no exception. I have no complain on this since the sambutan Ramadhan there is usually more meriah than here in KL. We left the house at around 9.30pm, we did not want to miss the first terawih so we left after that. 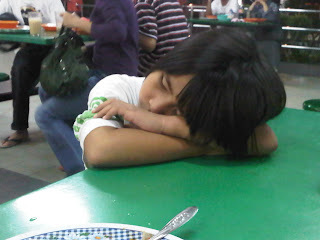 My baby was very tired and she slept on the way to kampung. However, we have to make one quick stop at R&R Ayer Keroh because my hero was hungry and my better half needed his coffee fix. 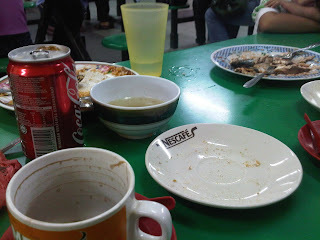 I only had roti bakar while the rest ate quite heavy food. I know we will have sahur later with my in laws so, keeping some space for that. My baby was so tired she had to be carried to the car. 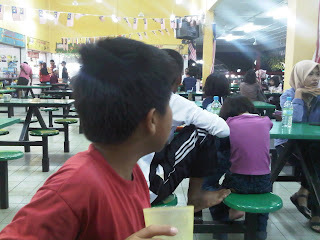 Imagine dah darjah 2 pun nak dokong lagik.